Homestays offer you a unique opportunity to stay with, and share the culture of Ladakhi people in remote villages, while trekking through rugged habitat of the endangered snow leopard. It allows you to enjoy the rhythm of life in hamlets where farming and livestock herding has been the way of life for centuries. These homestays are offered along trekking routes in Sham, Hemis National Park and Zanskar. 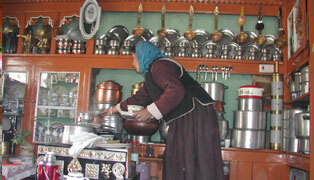 Homestay provide you a clean, comfortable room (with candle or solar light), furnished in Ladakhi style, traditional Ladakhi meals, cooked hygienically, using eco friendly methods, boiled spring water to drink, a clean dry compositing toilet and local nature guides in some of the villages. The three trekking routes are: Sham route takes you along the villages of Tarutse, Yangthang tokpo, Ule, Hemis Shukpachan and Ang. The route through Hemis National park goes through Rumbak, Urutse, over the Gandala Pass, down to Shingo, Skyu Kaya and across the Zanskar River to Chilling. The Zanskar route commences after a drive to Padum and takes you through Karsha, Pishu and Pidmo along the Zanskar River.